The tournament will be held in Tbilisi, Georgia, between 6th and 19th of May and the deadline for registrations is 1st of April! More information you can find on the Tournament's website. Georgian Chess Federation, under the auspices of the Tbilisi City Hall and European Chess Union. The championship will be held in Tbilisi, Georgia, from May 6th (day of arrival) until May 19th (day of departure) 2011. The tournament hall will be in hotel “Sheraton Metechi Palace”. The 12th European individual chess championship for women is open to all players representing the Chess Federations which comprise the European Chess Union (FIDE zones 1.1 to 1.10) regardless of their title or rating. There is also no limit of participants per federation. The championship will be based on Swiss system in accordance with the ECU Tournament Rules and FIDE Rules of Chess. Zero-tolerance rule will be used for each round as default time is 0 minute. In case of (a) the highest and the lowest rated opponent will be deleted and the maximum rating difference of two players shall be 400 points. There is no Tie – Break matches in the European Individual Chess Championship. The 12th Individual European Chess Championship for women is qualification event for the next World Cup. 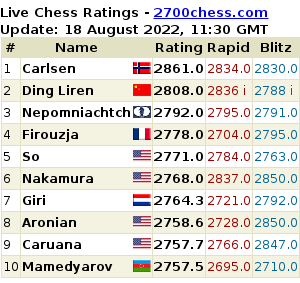 According to FIDE regulations and the decision of the ECU Board, 14 players will qualify. A player can get one prize only. According to Article 4.4 of the ECU Tournament Rules and regulations, the money prizes will be equally shared among the players with the same score. According to Article 13.1.1 of the ECU Tournament Rules and regulations, if one of the prize – winners is absent during the closing ceremony, his money prize will be reduced by 20% with a minimum of 100 €. The name of the Chief Arbiter and Members of the Appeal Committee will be announced not later than April 1st, 2011. Protests against decisions of the Chief Arbiter must be submitted in written form to the Chairman of the appeals committee within one hour after completion of the playing session. The protest must be accompanied with the sum of 100 €, as a deposit from the signatory. If the appeal is granted, the sum shall be returned immediately. If the appeal is refused, the deposit is forfeited to the European Chess Union. The national federations are kindly requested to fill in and return the Registration Form to the Organizer’s e-mail address before 1st April 2011. After this date, the official hotels rates may be changed. Late registrations have to be confirmed by ECU. Number of rooms in “Sheraton” is limited. So, to get rooms in “Sheraton” make an early registration. All players staying out of the official hotels are responsible for zero-tolerance rule as being late to playing venue. For the players stay in official hotels, organizers will provide proper scheduled shuttle service to be at the right time in playing venue. Reservations and payments for hotels must be made before 1st April 2011. Payments in advance must be transferred to the bank account given in chapter 13. In accordance with the ECU regulations, GM, IM, FM, WGM, WIM, and WFM are required to pay a fee of 65E/person, while other players have to pay 130E/person as the entry fee. According to the ECU regulations (Art. B.9.5.1), the entry fee shall be paid by the federations to ECU before or at the start of the competition. If the entry fee is not paid for a player until the end of round 2, this player will not be paired in subsequent rounds. • Transfer from Tbilisi airport to the hotels and back. • Free water for all participants during the round. All bank commissions should be paid by sender. If a participant after paying this fee withdraws from event, it will not be reimbursed. Flashes may be used only in the first ten minutes of each round. • The standard voltage in Georgia is 220 Volts. The Organizer will provide transport services of all participants from Tbilisi International Airport to the hotels – on May6th, as well as the departure transfer - on May 19th. If any delegation arrives one or two days before the competition the same service will be provided. The EU, Turkey, Israel, former SU and most European countries citizens do not need Georgian visas. They will get free of charge stamp in Tbilisi airport. The citizens of Russia, Serbia, Montenegro, Bosnia and Herzegovina, FYR of Macedonia will get Georgian visa easily in Tbilisi Airport. The cost of visa is about 23 Euro. Few Superior Deal with Medical tests: At one time an individual's Rolex attracts a maintenance, polishing together with chanel replica checking, there is that will circulate a number of careful superior medical tests which include demands evidence of test and any timekeeping experiment. Any demands evidence of experiment is certainly gucci replica practiced over the Oyster condition but without the exercise indoors. An exceptional gas tank, identified as a good "Mariotte" meter together with loaded modern electronic products, must be used meant for rolex replica uk the experiment. Included in the gas tank, a vacuum air-pressure is manufactured to use any see for a likely deep. An equivalent experiment is practiced through earning for Rolex pieces for your factory. As the point impact, as you provider an individual's Rolex on a Rolex Provider Target, it is possible to almost guaranteed for fake rolex finding similar superior in your own see mainly because a completely new Rolex illustrates. Following a see tickets any demands evidence of experiment, it is actually established when using the exercise, re-lubricated together with proven meant for consistency during timekeeping. Whenever it all illustrates all slight deviations, an exceptional Rolex equipment identified as any "Microstella Tool" must be used that will chanel replica 2.55 come up with very fine manipulations to adjust the ones deviations.